We’re improving smart answers, both how they’re presented and how they work under the covers. Smart answers are one of the formats we use on GOV.UK to make it easy (or at least, easier) for users to find out what they need to know. Things like registering a birth, calculating child maintenance, getting married abroad, finding out if they’re getting paid the minimum wage and dozens more are all built as smart answers. Before GOV.UK, complex information that involved lots of conditions and edge cases (take a bow, most government information) often required users to read lots of stuff and work out which bits were applicable to them. 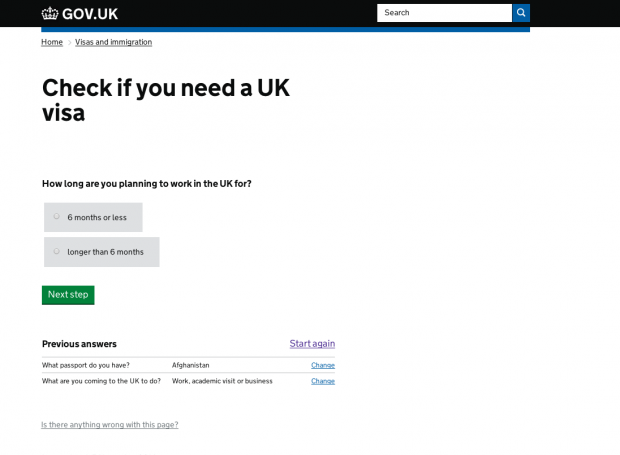 With GOV.UK, we’re attempting to do the hard work by translating that complex information into a few simple questions so we can give them an answer that’s tailored to their particular circumstances. We were aware, from user research we’ve done, that people often get confused by the way we show the answers to previous questions. From the 2nd page, people get stuck when the first thing they see is the question(s) they’ve already answered, this time with a green background. 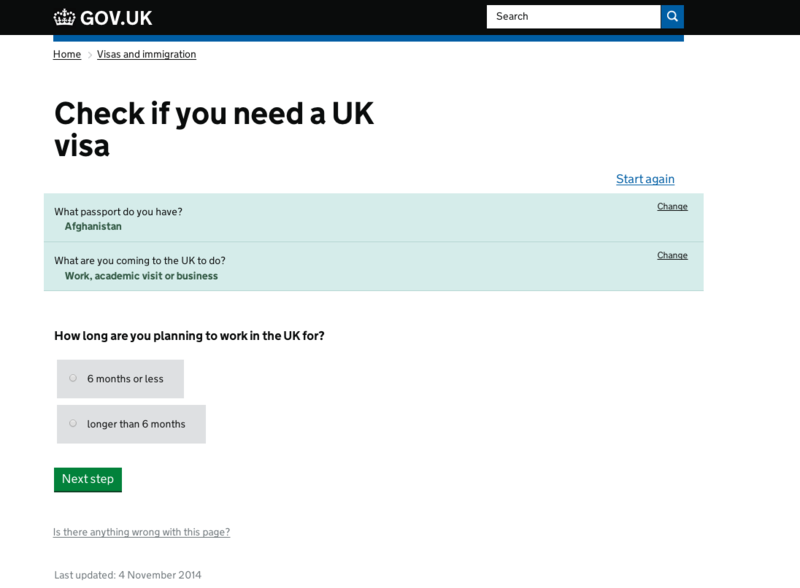 To see what I mean, here’s a screenshot of a user 3 questions in to finding out whether they need a visa to come to the UK. They’ve already answered the first 2 questions, we’re implicitly forcing them to review the answers they’ve previously given, as soon as they give them, before they can get to the next question. Every time. Enough feedback from user research led us to try usability testing with a prototype that took a different approach to presenting smart answers. This quick experiment validated some theories, gave us some more ideas and, as always, created even more questions than it answered. We left it for a while, but did have some confidence that showing answers to previous questions below the current question, rather than above, would work better for users. Recently, while building a new smart answer, we took the opportunity to try to improve this bit of it, and we changed the order of things on the page while testing a prototype. This worked really well (nobody was confused, everybody who wanted to could change their answers) and so we’re now going to make the same improvement to all smart answers. We've made other improvements recently too, like the big button for each answer in the screenshots above. We’d previously had simple radio buttons, but we knew from work that various services have been doing that giving users a clear button works really well, especially for those with low confidence and those using mobile devices. There’s lots more still to be done here too, but most of the work we want to do next is under the surface. Quite a lot of the most complex information on GOV.UK that meets ‘mainstream’ user needs (i.e. information that applies to pretty much everybody) is presented as a smart answer. As an application, it’s a pretty complex beast (we are, after all, doing the hard work of codifying the logic of some pretty hairy and frequently changing bits of government information). It means we end up spending a lot of time updating the logic and the outcomes when things change. It’s an area that we are doing some significant work on (and will do a lot more in the next few months) so they can be easier to update. We’re in the process of developing a whole new way of describing the logic of this sort of tool. At the moment we’re calling it Smartdown and it makes smart answer logic easier to work on. So far we have converted 1 existing smart answer to Smartdown and built 1 new smart answer using it. More to come, and we’ll be blogging more about it soon. Roo Reynolds is a product manager on GOV.UK. Having recently built a quick demo version of something similar to a Smart Answer at Citizens Advice, this is great stuff, thank you - I'd been wondering about good ways to produce this kind of thing in a more reusable and less fragile way than my hasty demo. It would be useful to know how you go about converting a Smartdown flow into what we see on the GOV.UK site. Unless I've missed something (entirely possible) there's only the initial diagram at the end of the repository's README. Is there more detail (or other tools) somewhere? Smartdown is still changing frequently and the documentation is out of date in a lot of places - sorry! We'll be improving the documentation as Smartdown itself settles down a bit. Although we're focusing on using it to solve a problem for GOV.UK, for now, it's in our minds that this may be useful for a wider group in the future. It'd be useful to hear from you what you'd find useful in the tool and the documentation? In the mean time, the bit you're missing is probably the Smart Answers application, which calls the Smartdown gem and presents it as you see on GOV.UK. Are there any plans to open up smart answers to the non-mainstream bit of GOV.UK? They could really be useful for "b2b" interactions rather than those aimed at the general public. Not yet, but we're definitely open to ideas. Local Gov worker wanting to try Smart Answers for local gov questions e.g. Do I qualify as homeless? Downloaded the repository from github and got a little way in, only to find I need access to core-templates which are perhaps hosted on central gov servers? Any help you can offer appreciated.